The Associate Degree in Product Design addresses the need for Professionals in the field of Design in Macao, covering extensive theoretical knowledge and practical skills, including but not limited to technical drawing, modelling and prototyping, graphic and visual design industrial design, ergonomics, design thinking, mobility and interaction design. Year 1 – The first-year courses offer theoretical and practical framework in understanding how graphic design is used to visualize and communicate ideas, and the basic concepts of design thinking. Students also acquire practical skills like the usage of different drawing media and techniques, and digital fabrication technologies applied to design fields. Year 2 – The second year emphasises in understanding the approaches, techniques and impact in product design. Besides, students also acquire product design skills through a series of drawings and models testing, and evaluating ergonomic designs. Students can also learn to develop visual and physical interpretations of mobility concept via the use of 3D software, computer rendering and prototyping to clearly communicate a design product to an audience. This module is an overview to the design field from its origins to the present day. The lectures will examine a variety of concepts and works ranging from graphics, product, fashion furniture, interiors, and architecture. These works will be positioned in a wider social, cultural, political and economical context within a historical narrative. Together with a chronological overview of periodic styles, this module will have a thematic approach in order to address concepts and methodologies relevant to the discipline of design. This will allow a bridge between historical and theoretical knowledge and the practice of design. This module will also take into account the relation between the object and its designer, as well as the evolving role of the designer — from industry related to activist, producer and creative leader. This course is designed to meet the needs of design majors by providing them with an understanding of the impact of graphic design on any design elements and everything in our society. Though lectures, discussions, and project analyses, students gain a basic understanding of how graphic design is used to visualize and communicate ideas. Architecture and Design are subjects that have a strong mathematical basis, namely Geometry, Trigonometry, Topology, and the study of patterns (including their modeling and generation), among other topics. 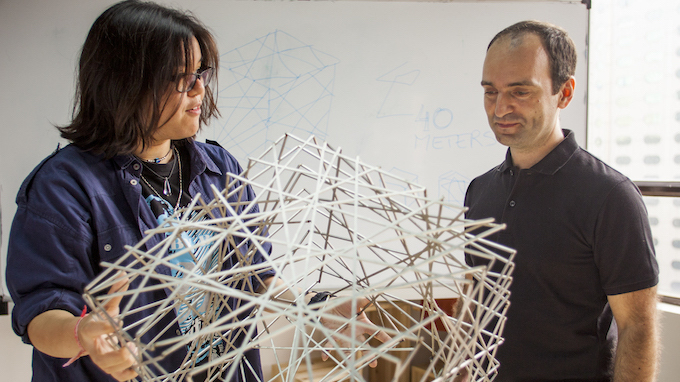 In this course, students will establish the link between mathematics and design through the understanding of theoretical mathematical principles and practical exercises and challenges, some of them using computer software and algorithms as interactive examples of generative design. In fact, with the advent of computers and new 2D and 3D-modeling software, formal manipulation and the creation of novel forms has become increasingly important in Design and Architecture. While these tools have made complex geometry much more accessible, an understanding of the basic principles behind these geometries is often missing. A basic knowledge of these principles will not only make these tools more efficient, but it will allow artists, communicators, designers to make much more intelligent formal explorations. Furthermore, knowledge of mathematical concepts– such as the Divine Proportion, The Golden Section, Fibonacci Numbers, Graph Theory, Fractal Theory, Probabilities, Randomness, Recursion, Hyper-dimensionality, and Geometry in general - will allow contemporary designers and communicators to understand their designs on a deeper level. This module lets students explore approaches and techniques in product design. Examples of different kinds of consumer and industrial products from different genres and parts of the world are analyzed to identify their strengths and weaknesses from different perspectives, including aesthetic, functional, structural, ergonomic, cultural and usage patterns. Students also work through a progressively more complex series of product design assignments, helping them to develop with confidence their technical skills, methodology and thinking approach. The final major project assignment covers the entire design process, from Research & Analysis to Concepts Generation and developing the Final Product Solution. This module lets students explore approaches and techniques in automobile and transportation system design, identifying strengths and weaknesses from different perspectives, including aesthetic, stylistic, cultural, technologic, ergonomic and usage patterns. This will have to be done in relation to the main phases of the "creative automotive design process". Starting from the research & analysis phase in line with a given project brief in the field of automotive/vehicle (assignment), the students will have to generate new ideas and identify new automotive related concept opportunities mainly based on market research, project brief objectives and specifications (supplied by project sponsor). Initially presented via "concept boards" including various medium such as diagram, text, hand sketch/renderings, mock-up, or any other necessary materials, the most promising design concept will be selected. This last one will have to be further developed from a technological, functional and aesthetical angle using 3D CAD software (renderings, technical drawings, etc) and other explanatory materials such as text description, pictures and prototyping. This module will act as an introduction to the graphic and interactive (digital) design fields. It will assist students with an understanding of graphic and digital products having in consideration technologies and relevant applications that are necessary for creating visually dynamic and graphic user-interfaces. Lectures will examine a variety of products, which will help students on future product development through best working practices. Students will also be powered with skills for the optimization of images, development of branded products and creation of graphical content for print and digital platforms. This course aims to explore the relationship between people and the things they engage or tasks they perform every day by establishing an iterative and applied design methodology which utilizes CAD/CAM systems for prototyping and 1:1 production. With an undercurrent of sustainability, the course will develop a series of drawings and models testing and evaluating ergonomic designs for furniture or other physically engaging apparatus created out of flat-packable sheet material. Starting with the collection and documentation of anthropometric data for each individual in the class, we will summarize and compare it with larger professional studies, to better understand our physical relationship with the objects and furniture around us. We will then move into individual designs, modelling with paper or cardboard and basic tools. Later we will learn how to prepare CAD files and operate a laser cutter so that models can be created with higher accuracy and thicker material. Following a number of iterations and pairing individuals to combine and re- evaluate designs, we will be creating the data for CNC milling the designs at full scale. Students will practice the process, purposes, and strategies of persuasive and explanatory writing. Students read and discuss works by both professional and student writers and explore techniques of argument and persuasion in writing a series of 5-6 essays. The module stresses revision, relies on frequent workshops of student writing, and aims finally to sharpen the students’ ability to use evidence in a reasonable, convincing way.